The Tax Resolvers is an accredited tax resolution company that offers a variety of tax services such as tax consulting, preparation, settlement, negotiations, and resolution. 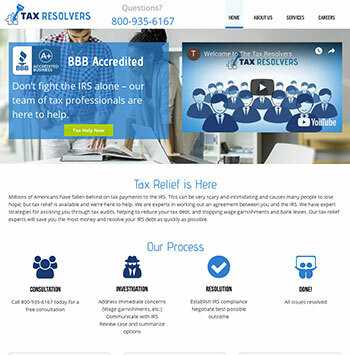 The Tax Resolvers is a marketing service that helps taxpayers who owe back taxes to the IRS find tax resolution professionals that include attorneys and tax companies. Interested consumers can request a free consultation from The Tax Resolvers' website. You can either do this by phone (877-353-1728) or by submitting a form that includes your name, email, phone, and the amount of tax debt you owe. They then take this information and pass it on to other attorneys and companies in your area who can work with your particular circumstance. You will then be contacted by a representative from these individuals or organizations to find a solution for your tax issues. A trained, experienced arbitrator who can negotiate terms and tax reductions on your behalf. The Tax Resolvers is accredited by the BBB with an A+. There is not a lot of information (including reviews and complaints) on The Tax Resolvers online. The Tax Resolvers' pricing depends on your unique individual circumstance and the company you are working with. Refund policies also depend on the tax attorney or company you are working with. Yes, but it can be much more challenging to pursue it on your own. Tax relief services like The Tax Resolvers have knowledgeable and licensed agents who have years of training and education. The amount of time tax relief takes depends greatly on the complexity of your case, how quickly you can return documentation to your tax experts, and what kind of program you qualify for.